A lot of people have been asking how I make my pots. Today, I finally got the camera into the studio, and did my best to document the making of one of my Flower Head Vases, like the one pictured to the right. The bottom segment, which has already been thrown, dried to leather hard, and trimmed, is cut in half vertically with a razor blade. 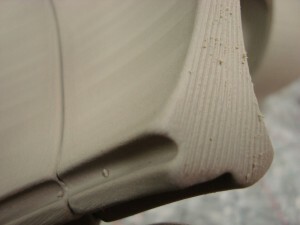 The two halves are then smoothed with a sponge, and scored using a Mudtools Long Stainless Steel Scraper with medium teeth. 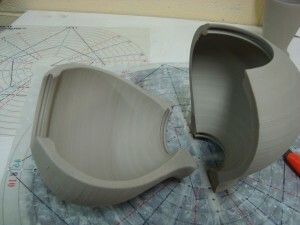 The segment on the left has been scored while the one on the right is freshly cut without alteration to show this step. I apply my joining slip to both halves, using small repetitive stokes in both directions parallel to the direction of the score marks. I take great care to make sure the slip is down inside the score marks, completely filling them. 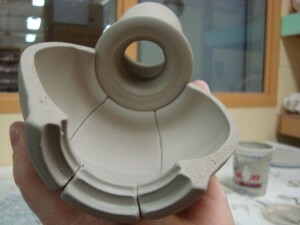 I carefully sponge off the excess slip from the edges and align the two halves. I apply pressure along the entire seam. I let the newly joined piece sit for 1 minute or so until the bond sets up. This is what it looks like. I carefully align the piece on my MKM Decorating Disc, since this will ultimately be cut into 6 segments, I use the blue 6-fold lines. I put the piece so that the seam is on one of those lines and it is centered. Using the other blue line as a guide, I vertically cut the part in half once again, now you can see how the first seam is a drawn line, and the new cut will become a second drawn line. The joining and cutting process is repeated one more time. The floor of the pot, a separately thrown and trimmed little disc, is inserted into the groove that I trimmed in there earlier. I throw, trim, and sign many of these discs and store them, I select the one that is the best fit by trial and error. 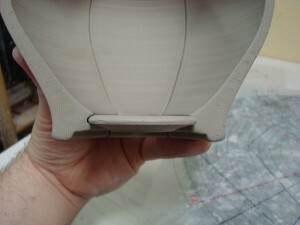 In much the same way, the top segment, which was thrown, trimmed, and adjusted to fit using a sponge, is inserted into the upper groove. 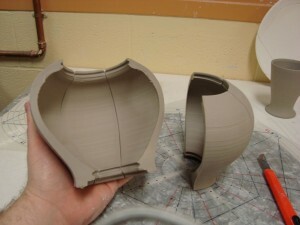 I do a test dry fit, to make sure nothing is so small that it wiggles, or so big that the seam cannot fully close. Once this is done, I slip the two halves, sponge off the excess slip, reinsert the other parts, and then stick it all together. It is at this point that I wish I had three arms instead of just the two. I know I’m crazy for doing this, people tell me that all the time. Check out those seams on the middle and underside. I can’t get enough of that. To me, it is absolutely worth all of this effort. Thanks for reading this, I hope you enjoyed it. Please leave questions/comments! nice website. have you checked out shannon’s, her stuff is awesome. so are you moving to the redwoods? You are insane and I love it! Yeah, Shannon’s stuff is awesome. I’m still on the fence about moving out there, it is a very hard decision. WOW!!! I cant imagine ALL that work, but you’re right..the outcome is amazing!!! it is totally worth all that effort… amazed by the idea. i’m thinking that the visual effect is like a cross between the body of a car where the panels meet and some long lost brancusi sculpture. 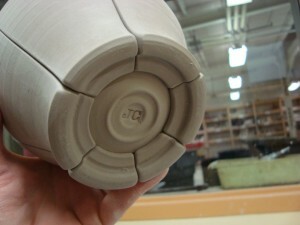 the bottom of the pot is really nice too. Right on! I think about those things in particular, especially the car panels. Awesome, you just made my day. Thank you so much for posting this. I could visualize you doing something like this, but thought it’s crazy to even think of something like this. You are just brilliant at what you do! 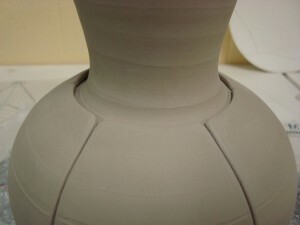 It is interesting that the lines you cut in your pieces are the focal point and interest, which is interesting since your work is all about throwing on the wheel. I would say that my work is about the interaction of all of the processes I use. 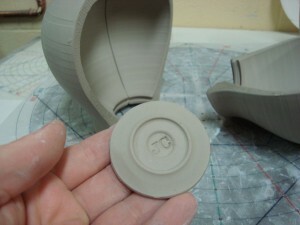 Throwing, cutting, glazing. The throwing marks are important because of the contrast they provide with the cut marks, the glaze unifies and makes things more subtle. 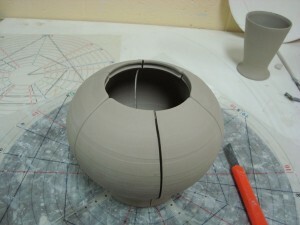 I will say that pots really seem naked or unfinished to me without the cutting process. I see thrown forms simply as blanks. Any tips for making the actual vertical cuts so nice and straight? I just eyeball it. Practice makes perfect (or close to perfect anyways). And they say there is nothing new under the sun, nothing that hasent been done before! Well, I don´t know about that, but I sure havent seen anything like this before. 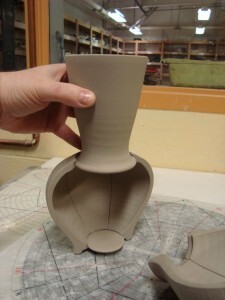 Does remind me of the plasterpart “joints”, for mass production, except turned inside out! Hey Jeff–GORGEOUS work!! Your work is so clean and precise. I am interested in how you make the groove in the bottom for the discs…seems like it would be hard to get a tool in there! Anyways, great work!! Actually I have a background in mold-making and do see the connection. 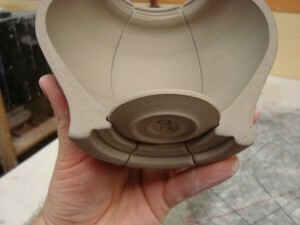 My molds are just as meticulous, the divides are almost exactly the same. 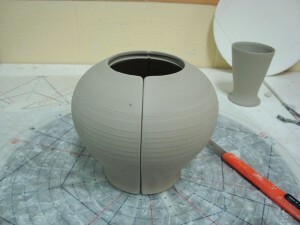 It has been my goal for some time to make the pot that has never been made before, so thanks for the compliment! The next post I do will be all about my discs, I’m working on it, but need to get someone to photograph me as I trim, that is the hard part. Hey Jeff, completely incredible work you’re doing! 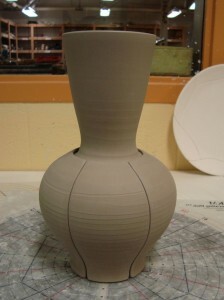 I’m in the start of my own ceramic career and your pots are really a source of inspiration for me. Wish I could learn from you!